The future of computer vision and machine learning can be seen trundling at about 1 mile per hour at a lettuce field in the Salinas Valley of California. In certain fields, a tractor is pulling a highly specialized robot called the “lettuce bot.” The robot, made by Blue River Technology, contains enough smarts to differentiate the weeds from the budding lettuce plants and then kill those weeds with an injection of fertilizer. An early wooden version of the lettuce bot. The result is a weed-free field without the use of expensive and harmful pesticides — making Blue River’s robot a threat to the $31-billion pesticide business and a friend of organic farmers. The startup, founded in 2011, on Monday said it has raised $3.1 million in a Series A round led by Khosla Ventures. Steve Blank, Ulu Ventures, and Stanford Angels and Entrepreneurs also joined the round. In addition, Ryan Kottenstette of Khosla Ventures has joined the company’s board of directors. Jorge Heraud, co-founder and CEO of Blue River Technology, said the funding, which comes after a $400,000 angel round and an early grant from the National Science Foundation, will help Blue River commercialize its prototype. The goal is to speed the robot up to 3 miles per hour while maintaining its accuracy at both classifying plants and then killing them. And while today’s model uses an injection of fertilizer to kill weeds, he hopes to eventually make the process mechanical so as to save on the cost of buying fertilizer. To create a robot that can replace human weed pickers is no easy task. Heraud explains that there are three different algorithms at work inside the robot. The first simply takes the readings of a camera that faces the ground and identifies whether or not it is seeing a plant. This means more than just figuring out that green is a plant. 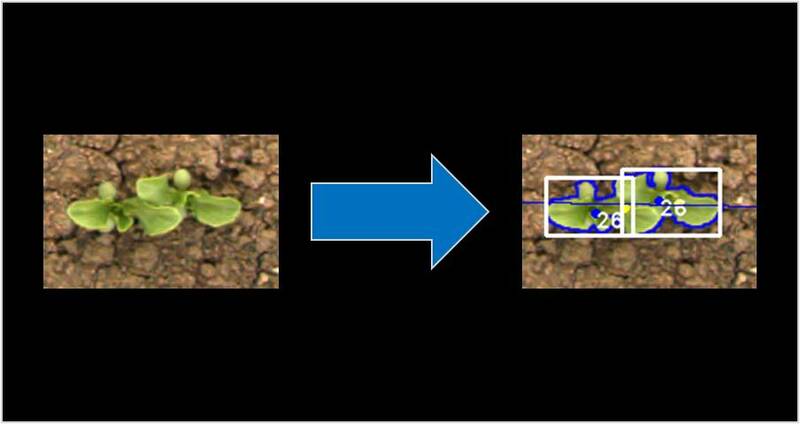 The algorithm also has to be able to tell where one plant ends or begins so it can later identify it. The second, called the Classify algorithm, determines if the plant is a weed or not. Heraud says the algorithm is about 98 or 99 percent accurate and was trained using a wooden cart they ran along participating farmers fields. “The farmers have been very cooperative,” says Heraud. He notes that it can reduce their spending on pesticides as well as their reliance on labor. The computer determines that these plants are lettuce. The final algorithm is simply called the Kill algorithm and its purpose is to determine when the correct moment is to inject the deadly dose of fertilizer. Because the killing mechanism isn’t in the field of view for the robot, it must determine where to inject the fertilizer based on how fast it is a moving and where the plant was when it classified it. It’s accurate to one-quarter of an inch at 1 mile per hour and the goal is to keep it accurate to one-half of an inch while moving at 3 miles per hour. Heraud’s lettuce bot is one example of a way we can use machine learning and computer vision to adapt machines to do more and more tasks. We have to program a computer to do something, but efforts like the lettuce bot are a way of letting computers understand their environments and then take pre-programmed actions based on the data they have. It’s not artificial intelligence, but it’s getting us closer. While having a weed-whacking robot might seem like a step away from machines that take over the planet, in reality they are highly specialized and limited pieces of equipment. 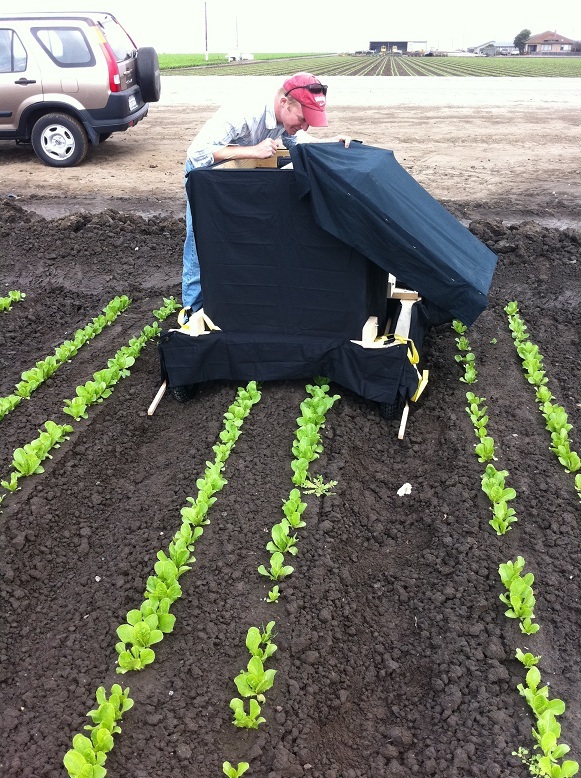 For example, the lettuce bot works on iceberg and romaine lettuces, but it wouldn’t work for corn or broccoli crops. The algorithms would have to be trained for each type of crop that Blue River wants to design an implement for. But with the growing number of people to feed, and the threat of pesticides on the environments, as well as the growing number of pesticide-resistent weeds, figuring out a cheaper and less chemically intense method of farming is an area where the brains behind machine learning can make the world a better place using some fancy math and decent compute power. This five-person startup may be working in the Salinas Valley, but its roots are in Silicon Valley. You do know that organic farms can’t use synthetic fertizlers right. Come peak oil what’s powering all those tractors, I guess solar tractors will be a reality soon (I’ve seen some home made jobs), hope so. Given an organic whacker pretty interesting but Permaculture principles call for a breadth of ecosystems not a narrowness and that’s the real way forward. Work with nature not against her. In high enough concentrations, fertilizer IS weed killer. Must be nice to have boat loads of surplus cash lying around. Surely the deadly injection would be weedkiller, nor fertilizer?